What if Mario Andretti and Parnelli Jones had succeeded in turning the VPJ4 into a winning proposition? Would Grand Prix racing have returned to being the truly global sport it once was? It is ironic that with all the glory, progress and heritage Italy brought to motor racing Italy's most successful racing driver should be an American. Mario Gabriele Andretti's first acquaintance with racing cars came in the picturesque Tuscan town of Lucca, where Mario and twin brother Aldo dabbled with a Stanguellini that the local garagist had bought for his son. 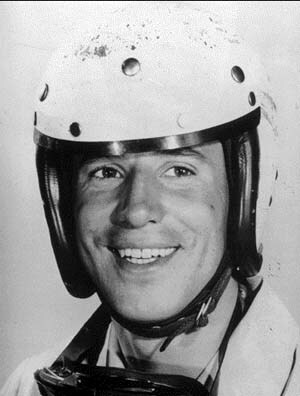 But it would be some 20 years later that the same Mario Andretti - now a US citizen - stood on pole in his home Grand Prix event, having missed out on making his F1 debut in the nation he grew up in. Finally the kid from Montona had made it into the sacred realm of Grand Prix racing but used a grand American detour to get there. Or can Mario's seasons in Europe be seen as a diversion to a very diverse and immensely successful US career? Either way, that's probably looking at it from a 21st-century perspective, in an age when the sporting chasm between the two continents is bigger than ever. AJ Foyt may be America's winningest driver on home soil but no-one from the US - or Italy, for that matter - can compare to what Mario Andretti achieved in all parts of the world. Short of being a rally driver, although you can't deny his skill on loose surfaces considering his prowess on dirt tracks, he's won in every imaginable top-flight championship. An American citizen from the age of 17 after immigrating from Italy, Andretti was among the best in Championship cars, sprint cars, stock cars, sportscars, Grand Prix cars or F5000 cars. He also had a habit of entering those scenes with a bang. His first qualifying run at the Speedway garnered him a brief pole before becoming Rookie of the Year. He started his first Grand Prix from pole. He cracked sportscar racing on his first attempt with NART. As with other racing brothers, it was hard to tell who would turn out to be best. Both born just ahead of war activity on territory that would become the scene of fierce battle between partisans and Axis troops, Aldo and Mario went westwards with their farmer parents as soon as war subsided and the frontiers around Triest were redefined. Suddenly, their part of Italy had become Yugoslavia and with many others wanting to remain Italian they were put up in refugee camps. Theirs was located in Lucca, a small town in the northwestern region of Tuscany, where from 1948 on they lived for seven years on a compound which put 27 families together in one large hut. The teenage twins got out as much as they could and were regularly found at a local garage where the owner gave them their first taste of car racing with the Stanguellini he had bought for his son. But then came their parents' decision to emigrate to the land of the free, in hope for better times. They joined their relatives in Nazareth, Pennsylvania, where everything started to fall into place. Their racing instinct had been awakened in Italy but it was here that it would be allowed to reign free. The circumstances were perfect. First, they happened to live so close to the nearby dirt track that they could hear the cars rumble. Second, their uncle Louis Messenlehner was keen to help the boys, not just with learning the language but also by assembling a 1948 Hudson Hornet stocker for them to race in the Sportsman class. In 1958, aged 17 but pretending to be 21, they entered the machine at Nazareth. Mario won first time out, Aldo crashed and suffered concussion. Mario needed all his youthful talents to convince his parents that his brother had sustained the injury by falling off the top of a truck while watching the racing… Their first race had been the decisive factor in the way their racing future would pan out. Aldo never reached Mario's level again and another serious impact in a 1969 sprint-car event made him quit the sport for good. Meanwhile Mario grew from strength to strength. After racking up the victories in the Sportsman class he moved to midget racing and entered over a hundred events in 1963 only, sometimes competing - and winning - three events on a single day. The tough no-pain, no-gain sprint-car environment, hustling high-powered cars around crowded dirt tracks, proved to be a learning ground that up until this day forms the grass roots of US racing and breeds the country's best oval racers in the business. It left him in good stead for the rest of his career. Joining the USAC ranks in 1964 Mario had to take time to digest the switch from sprint cars to roadsters, which needed precision steering to perform best on paved ovals instead of the elongated powerslides he was used to on dirt tracks. 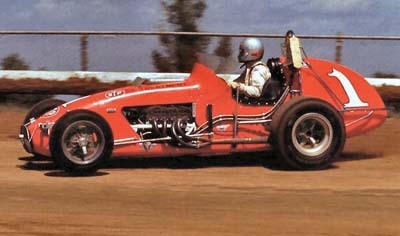 Chuck Hulse's injury, however, gave Andretti his break into the big time, taking over Hulse's seat at Al Dean's team. Teaming up with chief mechanic Clint Brawner the two quickly forged a winning combination. 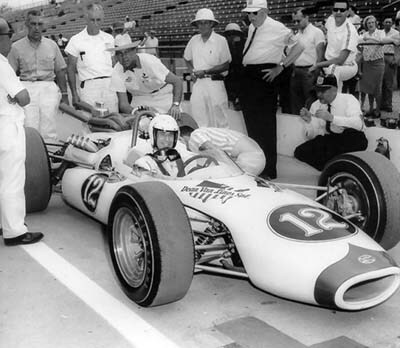 In 1965, on his Indy debut, his first qualifying run put his Brawner-Ford on a brief pole, and the race saw him take third place and Rookie of the Year spoils. His first win came in the Hoosier Grand Prix and in total he took 12 top-four positions to become - at 25 years-of-age - the youngest-ever National Champion at season's end. A star was born. He repeated the feat in 1966 by taking eight Champ Car victories and was Championship runner-up in the two years following, although he took pole both the '66 and '67 Indy 500 editions. 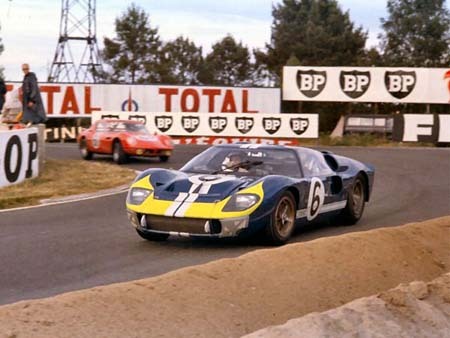 Meanwhile he showed the versatility he would become famous for by entering Le Mans and winning the 1967 Daytona 500 and Sebring 12 Hrs, making him a clear Driver of the Year in 1967. Now going it alone with Brawner after Dean's death in 1967, the duo picked up Andy Granatelli's STP support along the way, with 1969 being the undoubted highlight of their association, Andretti winning the National Championship and using the team's back-up Hawk for his only win in the International Sweepstakes. The year before, 1968, with Mario now being the man to beat in the US, the seasons of 'clashing commitments' had started. An offer to join Lotus at Monza proved irresistable but although he set 8th fastest time in first qualifying he couldn't make the race. Then came his amazing Watkins Glen pole. It was the same dream race debut that Carlos Reutemann was to make four years later - starting from the front in your home GP. Mario wasn't ready to become a full-time Grand Prix driver, however - and he wasn't going to be until 1975. His successful Champ Car season of 1969 was interwoven with sparse GP appearances, two of which came in the recalcitrant 4WD Lotus 63. At the 'Ring it was his turn to race it, and he must have been very weary of it after crashing its Champ Car equivalent, the Ford-turbo 64, into the Indianapolis wall at 150mph. The Lotus team was hoping for rain at the Eifel track, but whereas the previous edition of the German GP had been run in monsoon conditions, it was mild, sunny and dry on this day. There would be a final chance at the Glen where it did rain in practice, but Mario's poor performance effectively killed off what was left of the 4WD project. Even on a wettish track Mario could not get close to Rindt and his qualifying time was close to three seconds off the Austrian's time. 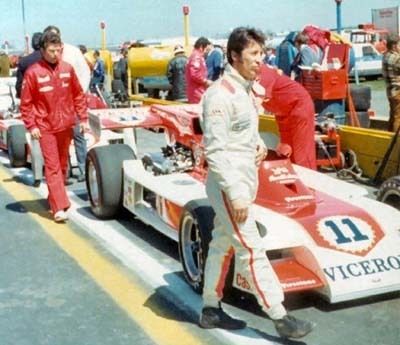 Andretti continued his STP-Granatelli association into the seventies. Granatelli also backed a part-season in F1, the STP logos now donning a March 701, with a third place in the Spanish GP his best result. That was preceded by a second win of the Sebring 12 Hrs in the illustrious 512S, sharing with Giunti and Vaccarella, having already finished third in the Daytona 24 Hrs, along with Ickx and Merzario. These guest drives were the beginning of a fruitful old-world cooperation with Ferrari, that would extend into Grand Prix racing in 1971. In his habit of producing shock debut results, Mario's first GP outing for Ferrari ended up in a win. Back in sportscars for 1972 he would have another magnificent season as Mario won all three US sports car classics - Daytona, Sebring and the Watkins Glen 6 Hours - and the BOAC 1000 kms too to deliver Ferrari the Championship of Makes. Meanwhile Andretti had moved USAC camps to join Parnelli Jones in the Vel's Parnelli racing team, with 1970 champion Al Unser Sr and 1971 champion Joe Leonard as team mates. While reigning champion Leonard retook the National Championship in Parnelli's own car Andretti's fortunes took a tumble into 1973. There was no F1 and the Parnelli cars didn't work as they did in '72, although Mario did set a new closed-circuit speed record at Texas Speedway, lapping at 214mph. While Andretti was back to form in F5000 in 1974, finishing second in the American championship, and also claiming USAC's National Dirt Track Championship, once again proving his versatility, Vel's Parnelli moved ahead with its plans to conquer F1. At Mosport Park, late in the year, Mario returned to F1 at the helm of the new Cosworth-powered VPJ4 and finished a credible 7th. At Watkins Glen, however, he cemented Parnelli's hope for a competitive 1975 season as he briefly stuck the American car on pole before slipping to third on the grid. It was a magnificent performance, as was his early-season win for Alfa in the Monza 1000kms. 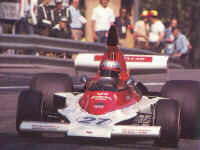 Incredibly, 1975 would be SuperWop's first full season of F1. But the promise of that 1974 US GP performance proved to be a fluke as the Parnelli slid down the grid as the season progressed. That is, full season - he did miss the Belgian and Dutch GPs due to his USAC commitments and took the Pocono 500 on the latter occasion. After two appearances in 1976 the Parnelli ground to a halt after the loss of long-running sponsor Viceroy, the tobacco company that inspired his helmet design. Meanwhile in F5000 in 1975, he was pipped to the title again by Brian Redman. Signing for Lotus - down for the count at the time - would prove to be the decision of a lifetime. 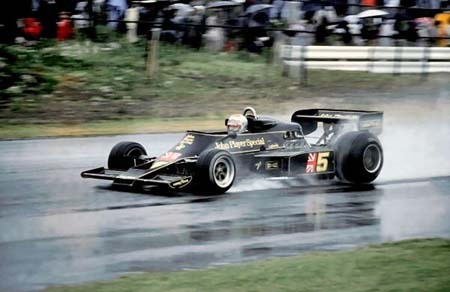 As the season progressed the Lotus 77 quickly became a front-runner, with Mario starting on the front row and retiring from the lead as early as the Swedish GP. Results started to come into the autumn when he took thirds at Zandvoort and Mosport, working towards the seasonal climax of winning the inaugural Japanese GP from the front. It was a remarkably restrained and clever drive in the most appalling conditions, and he eventually took victory by a whole lap. With Lotus catching on to ground effect the team would go from strength to strength with the 78 of 1977 and the all-conquering 79 of 1978. With his mind now fully set to F1, Mario was the fastest man of 1977 by far, taking seven pole positions, but a mid-season run of engine problems meant that these could only be converted into four wins. With that, he was still the winningest driver of the season but could not match the reliability record of both Lauda and Scheckter. There was no question of giving up their performance advantage in 1978, however, as from Zolder onwards the Mario-and-Ronnie steamroller turned the season into a boring exercise that would only see a different winner when Andretti ran into Cosworth trouble (another three times), slipped up (like in Austria) or, having been crowned champion already, was desperate for inspiration. Apart from claiming a fourth Champ Car title only a couple of years after his full-time return to the States, his F1 World Championship would be the highlight of his career. In 1979, the Lotus 79 was overtaken left, right and centre by emulations of the original while the Lotus 80 - late as it was - was one of Chapman's theories that never took off in real life (although we seem to forget that it did finish third on its debut in Spain). 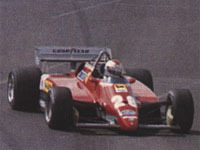 Along with Carlos Reutemann, who had mismanaged yet another move to a top-flight team, Andretti suffered a season from hell, preceding the same fate that new title holders Ferrari would undergo one year later. By the end of the season the Lotus 79, which the team had reverted to, was a tail-end qualifier. Things were indeed moving fast in F1 those days. Andretti stayed on for another year but was outpaced and outraced in the simple 81 by a young Elio de Angelis. It looked as if his heart was no longer in it, and he seemed to acknowledge that by grabbing the big money at Alfa Romeo for his last hurrah in Europe while already having restarted his US career by entering the late-season Gould Grand Prix at Michigan in 1980. In the month of May, he'd already put a Penske on the front row of the Indy 500, but the Michigan race in September was his real comeback to Champ Car racing, now in its new CART guise. He won. He then entered the final CART race of the season at Phoenix, took pole and finished a close second to Tom Sneva. In 1981, now racing a Wildcat, he took in as many races as possible next to his Alfa Romeo commitments, and started off well with two thirds at Milwaukee and Atlanta, and a second place at the second Atlanta race. 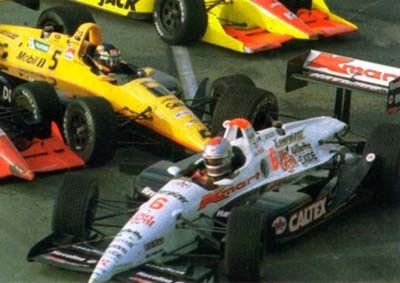 Steve Krisiloff replaced him for Michigan and the Bettenhausen 200 at Milwaukee, but he was back for the second race at Michigan, finishing second to Penske's dominant force of the day, Rick Mears. He finished the season with fourth at Phoenix, ending up 11th in the title race. In his first full CART season he would do three F1 comeback races, one for Williams replacing his former team mate Reutemann and two for Ferrari at Monza, where he famously took pole amidst the sadness of the team losing two champions-elect to death and injury, and at Las Vegas. 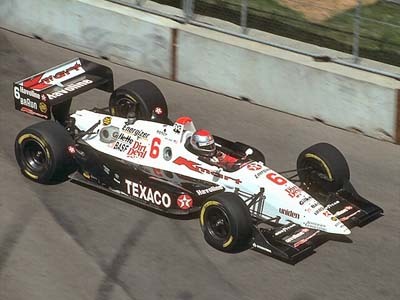 Although Rick Mears ran out to back-to-back CART titles relatively unchallenged, Mario did get several podiums, including four second places to finish third in the championship. New chapters were started in 1983 as he teamed up with the newly founded Newman-Haas team with which he was to stay until his Champ Car retirement in 1994, and with son Michael (and Philippe Alliot) on his quest for the Triple Crown by trying to add the Le Mans 24 Hours to his Indy 500 and F1 championships. They finished third in their Porsche, as the fastest privateer, and he was never going to get any closer. Ever the unlucky man at Indy, with just a single win from his 29 attempts, the second-most in history, Mario had only missed out the 1979 race since 1965. In 1984 he raced his son Michael there for the first time. Mario was forced to retire, while 21 year-old Michael came home fifth. Michael shared the rookie-of-the-year honours with former GP driver Roberto Guerrero, who finished second. Apart from Indy Mario had a great year. He won six times (Long Beach, Meadowlands, twice at Michigan, Elkhart Lake and Mid-Ohio) and became the 1984 CART champ. At age 44, and already a living legend, he was still very competitive, but this was to be his final title while remaining competitive well into his 50s. He bagged three wins in 1985 (Long Beach, Milwaukee, Portland) on his way to fifth place in the total standings. The following year, Mario's son Michael had finally taken over as the fastest man in the Andretti family. 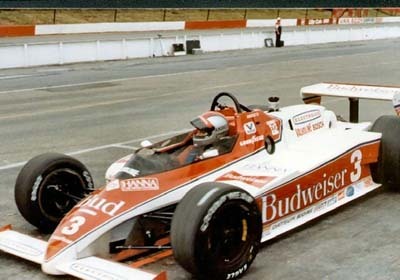 Bobby Rahal took the 1986 CART title while Michael was runner-up. Mario was fifth again, winning the races at Portland and Pocono. Both Mario and Michael had five poles each. Mario had an unlucky 1987, while a pole tally of no less than eight, proved he still possessed the speed. Two wins (Long Beach and Elkhart Lake) secured a sixth place overall while Michael was runner-up once again. Another two wins in 1988 (Phoenix and Cleveland) saw Mario, now 48, finish ahead of his son in the title race - Mario was fifth while Michael was sixth. For 1989, Michael joined Mario in the Newman-Haas team. Now Michael definitely had taken over as the team leader, and the old man was demoted to the second string. Mario had lean years during 1989-92, without any wins, while Michael proved himself as one of the very fastest. Another second-generation driver, Al Unser Jr, was now Michael's main adversary. Michael won the CART title in 1991 and was series runner-up both in 1990 and 1992. Little Al won the CART title in 1990 and 1994. Together with sons Michael and Jeff, and nephew John, Mario hit another milestone at Milwaukee in June 1990. It was the first time four family members competed in the same Indycar race. Later in the season, Mario also started the Michigan 500 from pole position. With this pole, Mario set a world closed-course speed record (234.275mph). Ultimately Mario would end the season with sixth place in the final standings. He went into semi-retirement, closely following his son Michael's Indycar exploits, while doing his annual Le Mans pilgrimage. The following year Mario was back with his son Michael and they were now part of the Porsche band wagon. 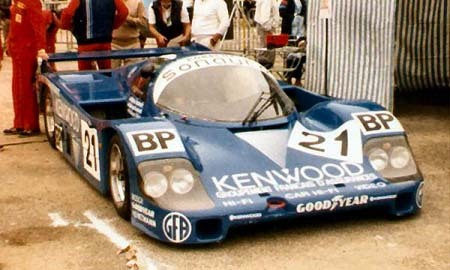 They were entered in a Kremer 956 together with Frenchman Philippe Alliot. They did a fine job and finished third, behind two works Porsches. They next opportunity would arise five years later, and this was probably Mario's best-ever shot at the endurance classic. Once again in a Group C Porsche, but a pukka works-entered Porsche 962C this time around, 48-year old Mario shared the car with his 25-year old son Michael and little brother Jeff, 24. Mario got the soft rubber and qualified the car third. They finished sixth, after running on just five cylinders towards the end. Due to his CART commitments Mario was forced to sit out the following six Le Mans. Aged 55, and already into retirement, Mario was back in 1995, once again with Porsche propulsion. Gone were the Group C cars. Now it was production-based GT cars versus WSC cars, which in some cases, were Group C cars with their roofs chopped off, but strangled by restrictors and by having 20-litres less fuel onboard. He was back for another try in 1996, once again for Courage Compétition. 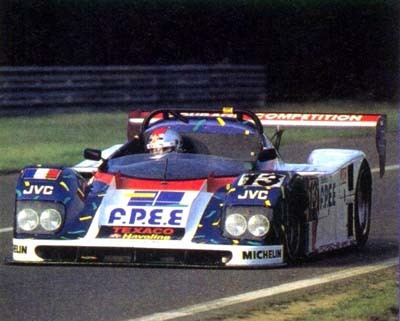 Mario qualified the Courage - which he shared with Jan Lammers and Derek Warwick - ninth, and second in class. Andretti's opening double-stint went according to plan but when Lammers had got into the car, the Le Mans jinx was back again to haunt Mario. Due to electronic gremlins the Courage started to slow down. Lammers: “It completely cut, came back and then cut again.” Lammers had to push the car into the pitlane. The problem took nearly one full hour to sort out and of course everything was lost. They were on course for a top-six position when a stub-axle failed and sent Mario crashing off into Indianapolis. Another thirty minutes in the pits meant that they finally came home 13th. Back at the greatest motorsports enduro for 1997, Mario once again co-drove with his son Michael. Frenchman Olivier Grouillard joined the American duo. But now both car and driver showed their age. The now ancient Courage was qualified a lowly 31st by Mario, a full ten seconds off the pole time. The car was among the backmarkers when Mario made a mistake into Tertre Rouge on lap 197. Mario crashed out and limped back to the pits with terminal suspension damage. Into the new millenium Mario did his final (?) try, aged 60, when he was invited to race the nostalgic Panoz Roadster together with David Brabham - son of Jack - and the rapid Dane Jan Magnussen. The entry qualified fourth and they were initially on the heels of the three dominant Audi prototypes. Mario could not match the times of his younger team mates. His times were six seconds off David Brabham's pace. Ultimately it was the reliability of the car that let them down as the gearbox internals had to be replaced twice on their way to 15th place. In a surprise move, the now 63-year-old Mario Andretti was called back into action in April 2003. The plan was for Mario to qualify the car usually driven by injured team member Tony Kanaan, and possibly also drive at the Indy 500 should Kanaan not recover. Mario said: "As we say in racing, let's take it one at a time. [Racing in the 500] is not in the plan and I don't expect that to be the case. I'm not starting a career again. This is something that's a great opportunity Michael gives me, and he knows I'm always up for a challenge." Michael Andretti was now the co-owner of the Andretti-Green Indy Racing League team. Mario was back in the saddle on the 23rd of April, in his first laps in an Indycar since 1994. He ran comfortably all day and did more than 50 laps with a best speed of 225.4 mph. However, the test ended with a spectacular crash just at the end of the session when Mario ran over some debris from Kenny Bräck’s car, who had hit the barrier just moments before. The nose of Mario's Dallara lifted and the car was flipped end-over-end up into the air. The car hit the catch fencing before landing upright. Miraculously, Mario climbed uninjured from the wreck. "Awesome. It was going well," Andretti said. "We were just working. We were learning things. We were back in the groove, making small changes. I mean small changes. The car was responding beautifully. "We were picking up some speed. Everything was just fine. We just needed another three minutes, and we would have walked away feeling very happy." "I was going for it, obviously, and I came off of Turn 1 at full throttle, and all of a sudden there was debris everywhere. It's just a freaky situation. It will not happen again, I'm sure. What I hit wasn't big, but it was solid, and it was able to launch me, and then all I saw was sky. I haven't been upside down too many times, and I didn't want to do it here," he said. "He proved he can drive the car, and the debris wasn't his fault. It could have happened to anybody, te debris was in front of him. It was just there," Carol Wilkins, spokeswoman for Andretti Green Racing, said. The next day Mario Andretti - perhaps wisely - announced he would not attempt to qualify for the 2003 Indy 500. So maybe Mario has finally retired for good. 40 year-old Michael Andretti completed 94 laps in the 2003 Indy 500 and also hung up his helmet after the event. It is really amazing when considering Mario's feat… just imagine Michael still winning races in 2016!